These master cylinders are available in aluminum or heavy duty cast iron. These cast iron master cylinders are designed to provide trouble free service under the most extreme conditions. The cast iron cylinders are designed not to wear out like aluminum master cylinders. 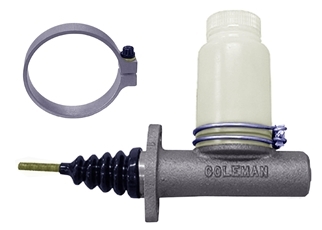 - Select - Master Cylinder-1"-Cast Iron-Coleman Master Cylinder-7/8"-Cast Iron-Coleman Master Cylinder-3/4"-Cast Iron-Coleman Master Cylinder-1"-Cast Aluminum-Coleman Master Cylinder-7/8"-Cast Aluminum-Coleman Master Cylinder-3/4"-Cast Aluminum-Coleman Master Cylinder-15/16"-Cast Iron-Coleman Master Cylinder-Rebuild Kit-1"-Coleman Master Cylinder-Rebuild Kit-15/16"-Coleman Master Cylinder-Rebuild Kit-7/8" Coleman Master Cylinder-Rebuild Kit-3/4"-Coleman Master Cylinder-Resevoir Clamp-Billet Aluminum Master Cylinder-Actuating Rod-7/8" and 1" Master Cylinder-Actuating Rod-3/4" Boot-Rubber-Master Cylinder Master Cylinder-Reservoir (No Cap) Master Cylinder-Reservoir Cap-Coleman Master Cylinder-Reservoir Clamp Master Cylinder-Reservoir O-Ring Master Cylinder-Rebuild Kit-7/8"-Coleman Master Cylinder-Actuating Rod-1" & 7/8"